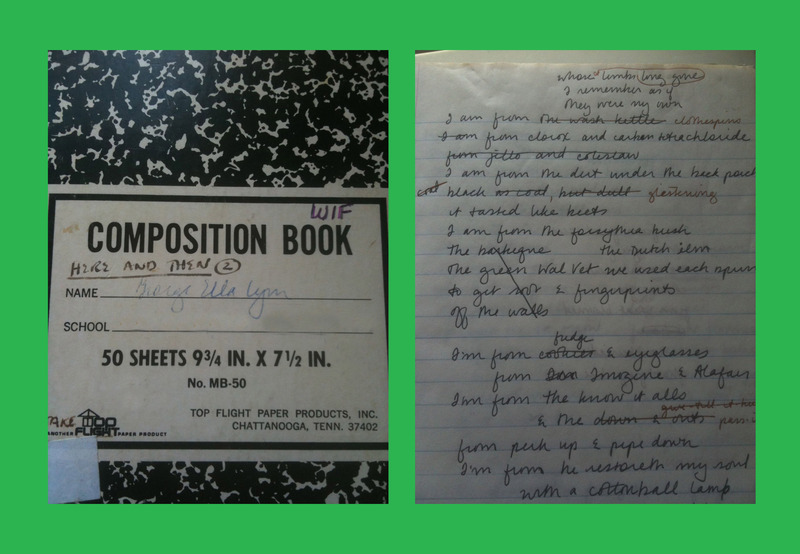 Twenty-two years ago, on the Summer Solstice in 1993, I began a poem called “Where I’m From.” Here’s the notebook I wrote it in, bought at the Radford University Bookstore where I was teaching in the Highland Summer Conference. The cover of my notebook and a page showing a draft of “Where I’m From.” I see on the cover that I was also writing “Here and Then,” a Civil War time travel novel here, too. Little did I dream, when I began this poem on page one of my new notebook, that I was starting a process that would involve countless teachers and writers, young and old, in the United States and in Germany, Great Britain, Spain, China and the Sudan, that folks would write “Where I’m From” poems in prison, a refugee camp, homeless shelters, English as a second language programs and children’s hospitals. Just as my poem took off from a poem in Jo Carson’s “Stories I Ain’t Told Nobody Yet,” and hers took off from something she heard somebody say, so “Where I’m From” has been handed around the world like sourdough starter. It’s been part of photo exhibits, videos, obituaries, family reunions and dance. “I’m from the . . . pass-it-ons” my poem says, and that’s what keeps happening to it, a testimony to the power of place, of poetry, of teachers and of the hunger for a voice. We could create a collection of “Where I’m From” (WIF) poems from all over the state! We could invite folks in each county to write theirs and then have one chosen randomly — I was adamant that this not be a contest — to put on the Kentucky Arts Council website. It can be a recording, a video, a song or whatever form the maker chooses. Much to my delight, the arts council folks liked this idea. And, in the WIF tradition, they added their own vision: How can this idea fit into the arts curriculum in the classroom and how it could turn into local readings across the state next April when we celebrate Kentucky Writers’ Day? I believe that writing belongs to everybody. It’s about getting what’s in your heart and head on paper so that you can understand yourself, so you can save what’s precious to you, and so you can share it if you want. We all have a trove of memories related to where we’re from. My poem is a list, chosen from pages of lists I made of experiences that shaped me. I played with the order and the arrangement on the page, and then I wrote that last stanza as a reflection on the whole. Above all, have fun. It’s your life. It’s your writing. You can’t go wrong.